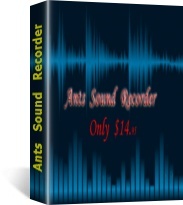 Ants Sound Recorder is designed to record audio streaming into audio files MP3, WAV, WMA, AAC, M4A, MP4. Then you may transfer the audio files to your iPhone or iPod with iTunes software. It's the easiest way to record absolutely any sound in real-time! You may also edit or play the audio files on your PC, and you may burn the audio files to CD Audio with a CD burner. Ants Sound Recorder makes your computer a professional sound recording and audio recording studio in the way of recording sound and voice from any sound card line-in and line-out, from microphone, VoIP conversation, or recording music played by other programs like Winamp, Windows Media Player, Quick Time, Real Player, Flash, games and so on, and saving it as MP3, WAV, AAC, M4A or WMA sound file. With Ants Sound Recorder, you may set these recording parameters: Channel, Volume, Sample Rate, Bit Depth. You may also configure the output audio format's parameters like CBR, VBR, Bitrate, Quality, etc. Ants Sound Recorder needs a Sound Card (or a virtual sound card) and Microphone to record from MIC. Record Complete Audio Streaming into Audio File. Record sound from all line-in, line-out, microphone, VoIP, Karaoke, mixer, etc. Record any voice, conversation and music played through sound card. Save your recorded sound as MP3, WAV, WMA, AAC, MP4, OGG, M4A file directly. Support Configuring Parameters of different audio formats. Easy recording operation and superior sound quality. A ultimate screen recording software for Mac users, it capture and records all screen and sound activity on your Mac in real time. enables you to record sound, played back through your sound card and any other sound sources like microphone,VCR, Line in, Telephone,Data CD,DVD,Audio tape player etc. RipEditBurn is an audio recording and editing Software.